Whether we are aware or not, the way our office desks look like can speak volumes about our personality, including how much work we can actually get done. Unless you want to be mistaken for a messy artist or an unreliable employee, you should pay attention to the clutter on your desk. A lot of research has been done to prove the relation between the office desk mess and productiveness. The results were appalling because not only does clutter affect your productivity at work, it also affects your brain’s activity throughout the day in general. In some cases, all that clutter can lead to a more serious condition of hoarding. The problem often exacerbates simply because we do not become aware of how much our clutter is literally slowing us down. Some companies have gone as far as introducing a “clean desk” policy to ensure their employees have optimal organisation and stay productive at an all time high. If you find yourself stuck in a rut at work, before you start blaming it on your employer, your disobedient kids, the pets or your partner, take a look at your desk to figure out where your latest stress and lack of ideas are coming from. Even if you think it is clean enough, there is always room for improvement to get you on the productive path without stalling. The organisation of your desk is not exclusively limited to what is on it, but what is in the drawers as well (if any). Depending on your job and the work requirements, not every type of desk can be your match. 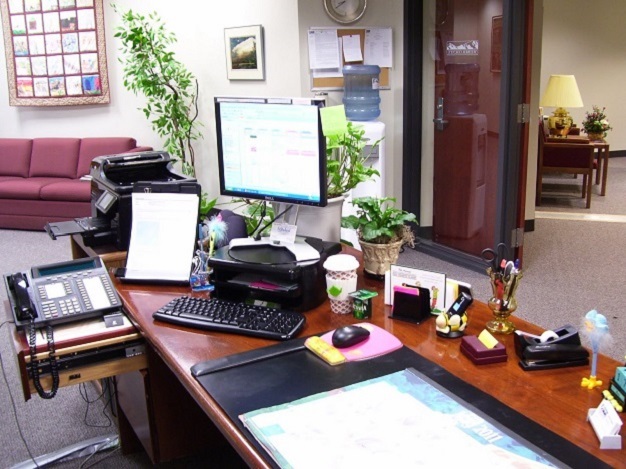 With the extensive choice of desks nowadays you will be able to find the office work desk according to your measure. Before matters get as serious as you becoming a master procrastinator and get piles of mess (where you can find leftovers of your lunch from last week or the long lost city of Atlantis) make sure you know how to choose the desk you need. To easily make up your mind about the office work desk you need, you have to consider your space. If a computer is the essential component taking up your desk space then it is advisable to buy a desk spacious enough to fit the computer with an additional part below to fit the central processing unit. The Albright Work Centre with its optimal storage, keyboard tray and drawers could be your perfect choice. If you have a minimalist office where you spend most of your time writing and doing paperwork, of course, you’ll have to look for a compact desk. If that is your case, the Durham Writing Desk with its built-in shelving feature is another desk made for you. For the more retro lovers out there, the Vintage Wooden Writing Desk is just the one. Combine it with a comfortable chair and you are set for a long office day. Once you get the one you want, it is important to have simplicity in mind. You would be surprised how much a small change with your desk can lead to simplifying your life. It takes determination to break an old habit and persistence to keep on sorting things until you effortlessly maintain your desk clean (to a subconscious level sort to speak).